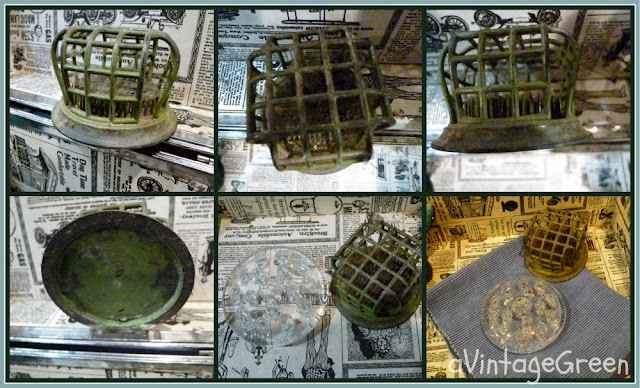 Just read a post on How to Make a Collage using PicMonkey. Check it out here. I went over to visit and tried it out. The tutorial worked. Here is my 'sample' of using PicMonkey to make a collage. I can see it needs a bit more practice but not bad, not bad at all. Thanks Hani from Craftonary. These finds are from last weekend but it has taken several days to process - had to learn how to use Collages in Picasa and then how to FIND where they were stored on my computer. I miss Picnik. 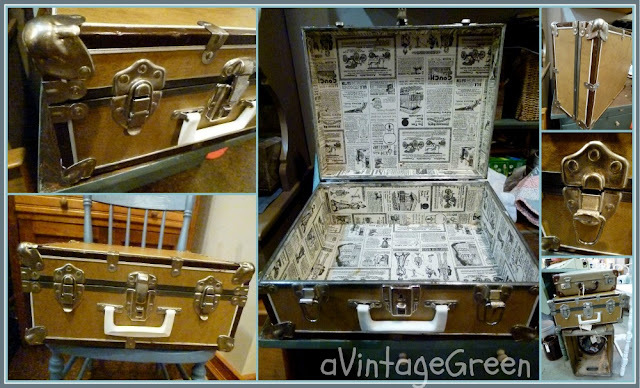 Trunk look suitcase, rust on clasps and corners, a bit of a dent in one side, lined in faux copies of Eaton's Catalogue pages. Everything works just fine. After I finally figured out how to get the pictures into a Picasa Collages folder and set up the collages I then had to find where they were, open them in PicMonkey and add frames and watermarks. 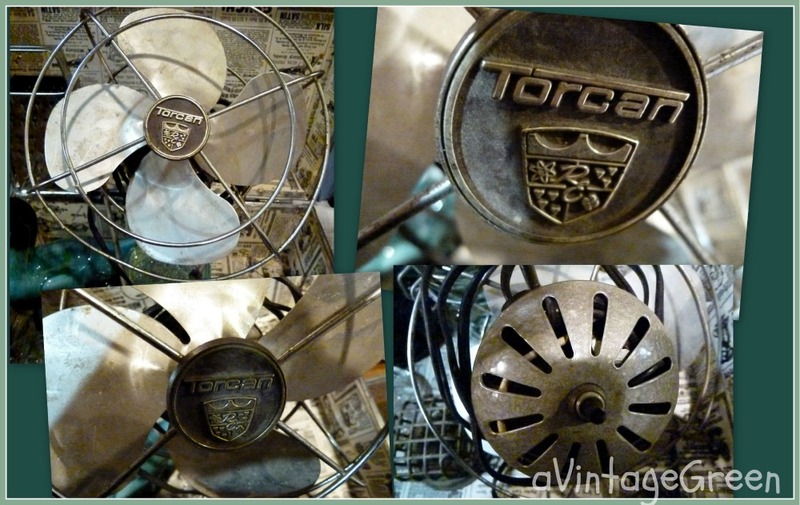 I am always very happy to find a vintage fan. Love the metal Torcan label. I am sure with practice I will figure out faster and more straight forward ways to get the collages/watermarks/frames done but it hasn't happened yet. I need to learn how to watermark. Thank goodness for my teenagers, I hate to keep asking them how to do stuff. Tech. savy I am NOT! Love your finds. I think you did an awesome job with your pics. I agree with how long the picture process can be. Sometimes it seems it will never get finish. But still you did great. I love the pics! I miss Picnik too! Thanks for the tip on PicMonkey. I saved it to check out tomorrow. I am not gifted along this line and need all the help I can get! Just saw your post and love it. It would be wonderful if you could share on Simple & Sweet Fridays. 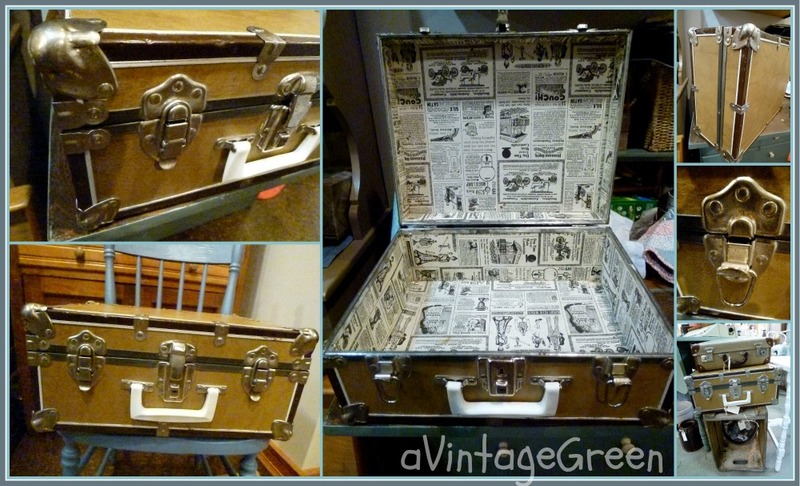 I'm going to try a suitcase with the collage papers. I have can't wait! New Follower. Followed over from Funky Junk. 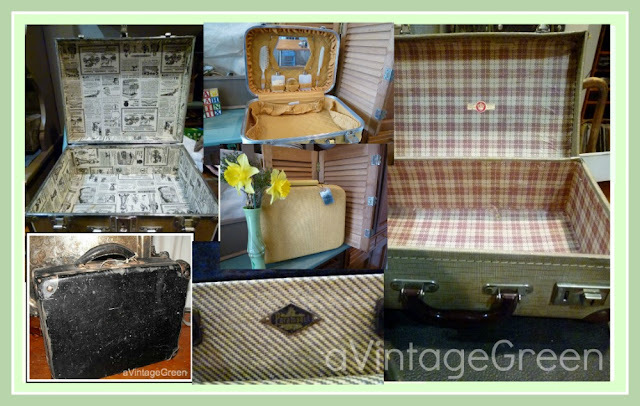 Collect suitcases and love these with the renew interiors! Hi Joy! Thank you for stopping by and leaving the sweetest comment!! You have found some gorgeous things!!! I'm drooling over the suitcases!! I have to find replacements for my Picnik habit as well. Thanks for showing me a great way to use PicMonkey! Love the look of the trunk. Thanks for the inspiration to keep on keeping on to try to learn new things/ways to edit photos on the computer. Your photos look great. Thanks for the link. I saw your post at "Funky Junk Interiors". Hey, thanks so much for linking up to Vintage Inspiration, I'll be featuring this post on VIF tomorrow!